These lemongrass chicken wings are perfect for grilling or BBQ, or even pan-frying them. They will taste great and wonderful. Chicken wings are always a big hit in my family. You can’t be wrong if you bring along some yummy wings to share in any party or BBQ gatherings. 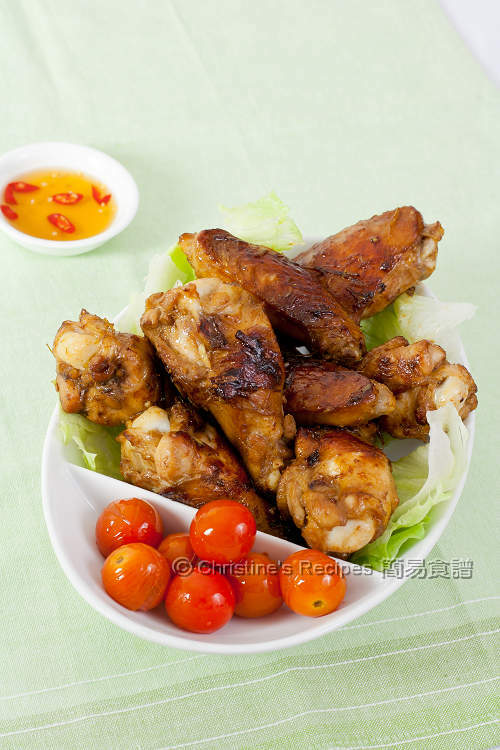 The marinated lemongrass chicken wings are suitable for various cooking ways as you wish, whether you grill them in an oven or pop them onto a BBQ stove, they would come out great and wonderful. I just pan-fried the marinated wings, and was very satisfied with their BBQ-like looking. The taste of the chicken wings was sensational with rich flavours. Rinse the chicken wings. Drain well and wipe dry. Cut into pieces at joints and discard the tips. (Note: you might like to save the chicken tips for cooking soups). Pound the white lemongrass stalk and finely chopped. Mix the chicken wings with the lemongrass and marinade well. Cover and refrigerate for at least 2 hours or overnight. Remove from fridge and rest in room temperature for 10 minutes. Drain the chicken wings. Discard the lemongrass and marinade. Heat oil in a frying pan. Cook over medium-high heat until cooked through and both sides are brown, about 4 minutes for each side. Cooking time might vary depending on how big your chicken wings are. Dish up and set aside. Discard the excess oil in the frying pan. Add the cherry tomatoes and stir fry until soft. Season with salt. Dish up for garnish. Serve the chicken wings with fish sauce, mixed with some sugar, freshly grated lime juice and red chillies if you like. Enjoy! Don’t overcook the chicken. The meat will turn dry and tough otherwise. I like to fry both sides of chicken wings until golden brown, then cover with a lid to cook for 2 to 3 minutes. By doing so, the middle part of chicken can be cooked through very quickly without loosing too much moist. Then remove the lid and continue to cook for a while, letting the wings dry up a bit on the surface. The oil in the chicken skin will be released, but the meat is moist and juicy. The intensity of saltiness of different brands of fish sauce is different. Adjust the amount accordingly. For your reference, I used this Three Crabs Fish Sauce. I absolutely enjoy the flavors you are using here....esp the aroma of lemongrass and essence of the "oil" infusing into the marinated chicken wings. can i use oven instead, would it be nice? As Elin said, this is finger licking good and lemongrass is so aromatic! 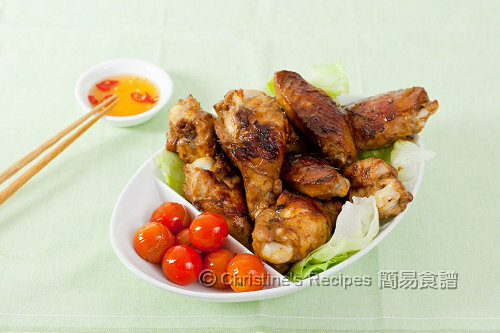 The lemongrass chicken wings can be baked in oven, taste wonderful too. Hmm lemongrass is so fragrant! I see that you mostly focus on chinese recipes! I've made korean style chicken wings with korean chili paste and that's delicious too! I just wanted to say that I tried this recipe last night, and it was absolutely amazing. I made a few changes though, I added one more stalk of lemon grass and instead of pan frying, I baked them for 10 mins and broiled them for 6 at 450 F. I also used a different type of wine (still chinese wine). The fish sauce was just the most awesome addition, I've never cooked with it before, but now that you've introduced me to it, I can see all the possibilities! Thanks Christine, we had it for dinner. Very nice! These look so tasty. I will absolutely be making these chicken wings this weekend, thanks!!! I am going to do it again! I love this simple but yummy recipe!